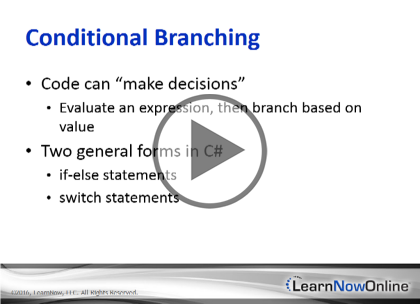 C# provides a number of methods for making decisions as code executes. You can branch execution of your code based on conditions you define—anything from a simple check on the value of a variable to the value of a complex expression that you create—with if and switch statements. Another common technique is to execute one block of code over and over again until some condition is met, which can be accomplished with the various kinds of loops provided by C#. Finally, C# supports jumping to locations in code outside of the normal sequential order of statements. You’ll even learn some narrow and specific uses for the much-maligned goto operator. This course builds upon: Programming C# 6: Getting started, Your First App, Projects and Syntax and Variables and Data Types.